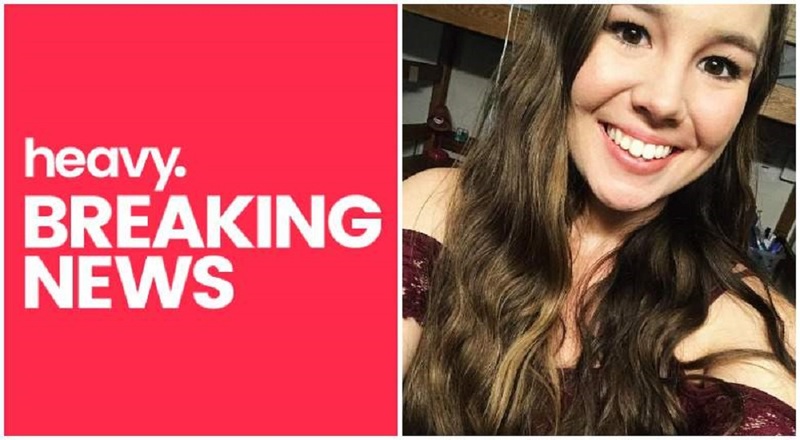 Another American woman has been sacrificed on the alt-left’s altar of political correctness and the coddling of violent lawbreakers claims one more daughter of the USA. The news media on Tuesday night filled their broadcasts with pro-illegal alien activists when it was discovered that the Democratic Party spin doctors’ key political issue for garnering votes may have blown up in their faces. As if Americans don’t know the truth, the media as usual are pretending they’re non-partisan when they downplay the significance of the killer’s immigration status. 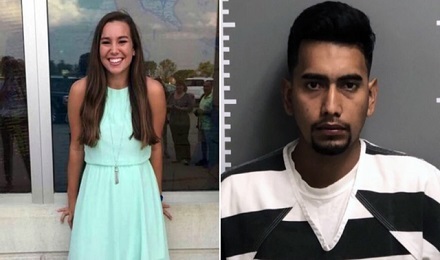 The Iowa state police announced on Tuesday that an illegal alien (who is being labeled an undocumented immigrant), 24-year-old Cristhian Rivera, was arrested and charged with first-degree murder for the killing of an Iowa university student, 20-year-old Mollie Tibbetts. On Wednesday, July 18, 2018, Mollie Tibbetts was last seen jogging in Brooklyn, Iowa in the evening hours. Since then there have been no credible sightings of, or communications with, Mollie since that time until today. While most of the nation’s news media are playing down Rivera’ s immigration status, police sources informed Conservative Base that the suspected murderer is a Mexican national and he led police detectives to her body in Poweshiek County, Iowa. The suspect was charged after more than 30 days of searching for Tibbetts. She reportedly disappeared when she went out alone to jog. Police investigators from federal, state and local law enforcement who searched for the missing Iowa college student said they had been focusing their efforts on five locations. During the lengthy missing persons investigation they had interviewed close to 1,500 people. Tibbetts who was born in San Francisco, lived in Brooklyn, Iowa, with her mother. She had won public speaking competitions, studied acting and ran cross-country besides being an academic honor student. She was majoring in psychology which was her mother’s profession. Her family and dozens of volunteers in the small town of Brooklyn, with a population of about 1,500, had been searching for any sign of Tibbetts. Cops and civilians searched the terrain including the pig farms and just last week police commanders announced they were refocusing their search. 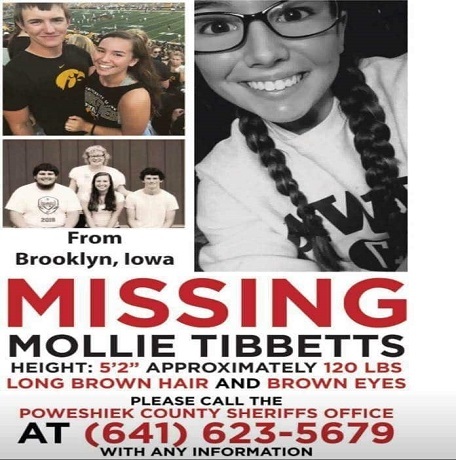 It was then that police detectives first found the remains of Tibbetts and within hours of the discovery of Mollie’s remains they captured the suspect. “What they didn’t expect to find is that the perpetrator of this heinous crime is an illegal alien who had a Immigration and Customs Enforcement detainer placed on Rivera,” said former police detective Michael Snopes, a former member of a homicide unit. Mollie joins other women killed or assaulted by illegal alien thugs. One of the nation’s biggest manhunts occurred in Washington, D.C. Congressional intern Chandra Levy became a posthumous celebrity when the 24-year-old vanished 17 years ago and whose remains were eventually found by police. The man — an illegal alien from El Salvador — accused of her abduction and murder was arrested by police. Chandra Levy’s disappearance was a huge news story for months. That is, until it was discovered an illegal alien murdered her. Then the story seemed to disappear. The Chandra Levy case originally received so much media attention that she became a household name in May 2001. In January 2009, while the news media continued their fascination with this case, they had — for the most part — failed to identify the suspect as an illegal alien already locked up in prison for previous attacks on American women, preferring to call him an immigrant or a Salvadorian National. The irony of the Chandra Levy murder case is the fact that the biggest murder case in the new millennium was a homicide committed by an illegal alien. “The media frenzy seemed to end abruptly once it was discovered Levy’s killer wasn’t a powerful white guy in Washington, but a criminal alien with a history of preying on women,” said former police detective Mike Snopes. “The fact is that many of the predators in the U.S. are illegal aliens. They prey on women and children throughout the nation,” said the decorated detective. When the National Association of Former Border Patrol Agents (NAFBA) released their position paper on all aspects of the illegal immigration issue, most media outlets either yawned or suppressed the report. Over 250 former Border Patrol members of all ranks signed the document, which received scant mention by the mainstream news media. The position paper addressed amnesty and guest worker programs, securing the US borders, sanctions against employers of illegal aliens, and condemnation of political leaders who subvert and undermine the efforts of the U.S. Border Patrol and the Immigration and Customs Enforcement (ICE) directorates of the Department of Homeland Security. “The nation has made demonstrable mistakes in the past in its efforts to control immigration. Let us, who were there to see them, remind the nation of the outcome and make suggestions for change,” said Kent Lundgren, coordinator for the NAFBA.